Sober Look: Is Carney about to surprise the markets with a 2014 rate hike? Is Carney about to surprise the markets with a 2014 rate hike? Carney of course is talking about an interest rate hike in the UK. Indeed, as UK's unemployment rate drops to new post-recession lows (see chart) and home prices continue to rise, the time to begin rate normalization is fast approaching. The Bank of England's (BOE) policy trajectory is diverging sharply from that of the ECB - as reflected in short-term rate markets. The spike in the 2y UK gilt yield (above) was in reaction to Carney's comment, while the drop in 2y German yield was in reaction to Draghi's recent announcement of negative rates. Currencies had a similar reaction, as the euro tanked against the pound. 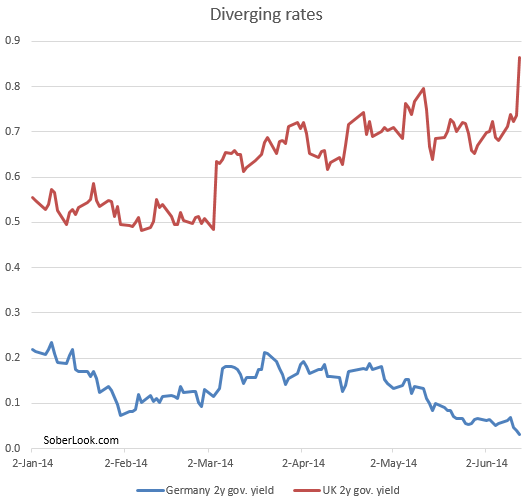 When do markets anticipate this first rate hike in the UK? 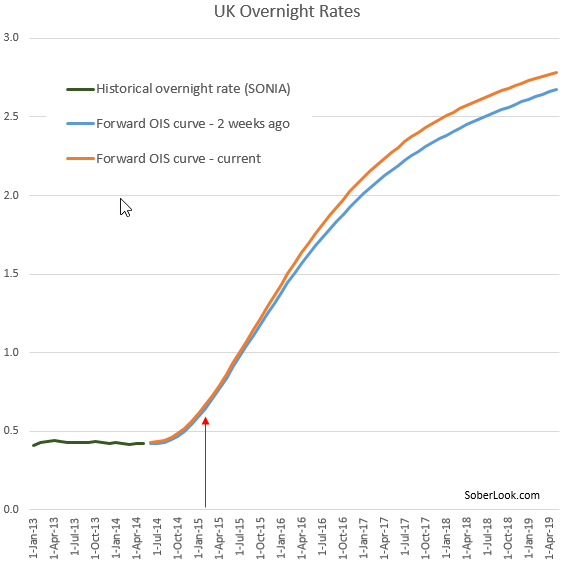 According to the forward overnight index swap (OIS) curve, we are looking at early 2015 for the first increase - followed by a steady pace of hikes for at least 2 years. This is about half a year earlier than the expectations of the first rate increase in the US. While some view this timing as appropriate or even too optimistic, Carney could in fact take action even sooner. The reason has to do with real rates (rates adjusted for inflation expectations). In spite of UK's higher rates relative to other developed economies, the Bank of England's current policy remains highly accommodative. 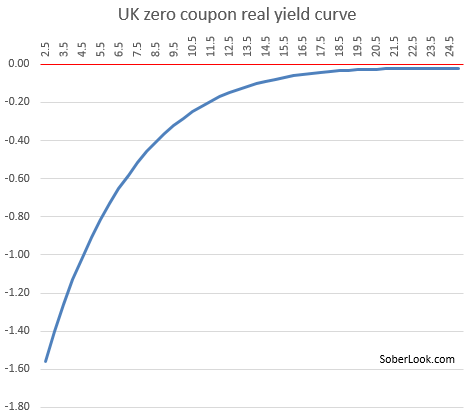 Unlike in the US for example, where implied real government rates for maturities longer than 6 years are positive, the UK's entire real yield curve is in the negative territory. This level of BOE accommodation puts additional pressure on Carney to pull the trigger on rates - and potentially surprise the markets. Citi (Michael Saunders): - In our view, this speech marks an important change of tone from the Governor, removing any sense that the MPC [Bank of England's Monetary Policy Committee] is on auto-pilot and locked into inaction until some distant preset date. We continue to expect that strong economic growth and the tightening labour market will prompt the MPC to start to hike before year end, with rates rising earlier, further and faster than markets currently price in.